A chance of showers and thunderstorms before 3pm, then showers likely and possibly a thunderstorm between 3pm and 5pm, then a chance of showers and thunderstorms after 5pm. Mostly cloudy, with a high near 59. Southwest wind 5 to 15 mph. Chance of precipitation is 60%. A chance of showers and thunderstorms before 3am, then a slight chance of showers. Mostly cloudy, with a low around 39. South southwest wind 5 to 10 mph. Chance of precipitation is 50%. A slight chance of showers, then a chance of showers and thunderstorms after noon. Mostly sunny, with a high near 62. West wind 5 to 15 mph. Chance of precipitation is 30%. A chance of showers and thunderstorms. Mostly cloudy, with a low around 43. South southwest wind 5 to 10 mph. Chance of precipitation is 40%. A chance of showers, with thunderstorms also possible after 9am. Mostly cloudy, with a high near 65. West southwest wind 10 to 15 mph, with gusts as high as 30 mph. Chance of precipitation is 30%. A chance of rain showers before 3am, then a slight chance of rain and snow showers. Some thunder is also possible. Mostly cloudy, with a low around 40. Chance of precipitation is 40%. A slight chance of rain and snow showers before 7am, then a chance of rain showers. Some thunder is also possible. Mostly cloudy, with a high near 61. Chance of precipitation is 40%. 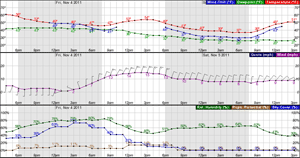 A chance of rain showers before 3am, then a chance of rain and snow showers. Some thunder is also possible. Cloudy, with a low around 39. A chance of rain and snow showers before 8am, then a chance of rain showers. Some thunder is also possible. Cloudy, with a high near 57. A slight chance of rain showers before midnight, then a slight chance of rain and snow showers between midnight and 4am, then a slight chance of snow showers after 4am. Some thunder is also possible. Mostly cloudy, with a low around 38.